Are you thinking about running a half marathon? Are you unsure what to expect? Here is Part 2 of one woman’s first time experience. If you missed it, check out Part 1: Finding Inspiration, Making a Plan and Gaining Confidence, Smart Training and Dealing with an Injury. I would be remiss if I talked about my race training without mentioning the mental portion of the endeavor. Running is a VERY mental sport. You can train your body to handle these longer distances, but if your mind doesn’t believe you can do it, you’ll be lucky to get half way. On the Friday and Saturday leading up to a new long run, I would repeat my intention over and over again. It was like a mantra. “I am going to run 7 miles tomorrow.” “I am going to run 8 miles tomorrow.” This technique helped my mind truly believe that this was a solid intention and I was going to do it. Positive affirmation statements are extremely powerful tools for athletes. I know of several elite athletes who will physically write out their intentions and post them on prominent places throughout their home and work environment. “I can do this. I am able to run this distance. I will succeed.” Repeating these statements to yourself over and over will help your mind truly believe and result in better performance. If you want to learn more about this topic, I highly suggest a book entitled “With Winning in Mind” by Lanny Bassham. When I got to 10 miles that week, I still had gas in the tank. I only had enough to make it to 11 miles, but that was enough for that day. 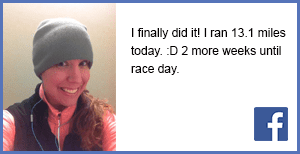 I was able to work my body and mind up to longer and longer distances by only focusing on that day’s run. I didn’t let myself dwell on the ultimate goal because that was going to be too much to grasp. Instead, I focused on my distance that day and in that moment. One foot after another. I also broke my run into doable segments. I would think of the longer runs in terms of how many 5K portions they included. At this point in my training, a 5K was small potatoes. So running three-5K runs shouldn’t be too bad! These are not professional mental tricks, but they worked for me. Figure out what works for you and use it. Whatever you do, don’t EVER tell yourself ‘I can’t do it.’ That negative thinking is only going to lead to self-defeat. Time has a way of passing whether you want it to or not. Before I knew it, I was in my car driving an hour to the race site to pick up my bib number and swag bag. 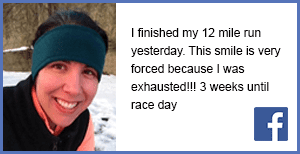 This was actually a helpful process for me because it gave me a chance to get in the spirit of the race, meet other runners, and see the course landscape. I left the registration building pumped up and ready to go. That evening, I ate a carb heavy meal of pasta and grilled chicken expertly prepared by my hubby. I also spent some time looking over the course route, checking the weather, packing my supplies, and prepping my iPod play list. Okay, I’ll be honest… I spent hours doing all of this. Perhaps it was a bit much, but it helped me feel comfortable with the whole process knowing I had read through the ENTIRE athlete packet and understood how the event was going to run the next day. My particular event had several thousand entrants so I had to consider things like parking, shuttles, and an extra early arrival. Race morning dawned into a gorgeous spring day and, at 8:00am, the starter set us off to begin the race. I once had a friend say that a half marathon is a great distance because you can have the worst and best day of racing all in one race. He was totally right and I started off the first 4 miles with the worst race ever. First off, I was a bit over-enthusiastic with my pre-race hydration and realized during Mile 1 that I needed a bathroom stop. Luckily, I found Port-a-Potties at Mile 2 and was able to zip in and out quickly. At Mile 4, my legs cramped up very badly. My calf muscles felt like two rocks shooting pain up into my legs. Here was my mental process… Ouch! Ouch! Keep going! Ouch! 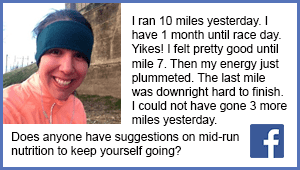 You did NOT spend $100 on registration and train for 12 weeks just to give up at Mile 4!! Ouch!! So I kept going at a snail’s pace and my legs eventually loosened up by Mile 5. From there on out, I felt AMAZING! My iPod magically played the perfect song to propel me forward into a steady rhythm that carried me the whole way to Mile 13. My time wasn’t incredible. My placing was nothing to brag about. But despite my early troubles, I did manage to PR by 4 minutes. Woot! Above all, I FINISHED MY FIRST HALF! So here’s my advice for Race Day Prep. Take your time and think through all contingencies. Your particular race may have special challenges like parking, poor weather, or registration that you need to think through beforehand. Get all of this prep stuff done well in advance so you have time to relax, calm your mind, and focus on the task at hand when the starting gun goes off. A little pre-race meditation is also a good idea if you’re into that. Second – Don’t panic if things go wrong. Just take each new challenge as it comes and remain calm. You’ve prepared for this event. Your body can do it. You just need to stay focused and determined. Crossing the finish line will be an incredible feeling. 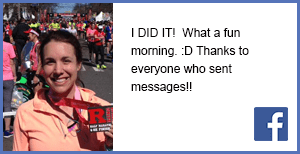 You’ll feel incredibly proud of yourself and happy to have finished. Sure, you may be stupid tired and sore, but your overwhelming emotion is just going to be happiness. Take a moment and drink it in. Get some photos too! As you know by now, this was my first half-marathon race. I am fully aware that there are many more experienced runners out there who run farther and faster. My hat off to you! You continue to be an inspiration to me. By all means, please comment below if you have additional tips or comments for our readers. Check out Hal Higdon’s half-marathon training guides to make your own running plan. If your shoes are older than 6 months, consider buying new ones. Definitely go to a running store where the staff can examine your foot shape, gait, and recommend the proper type of support. You may pay a bit more, but it’s totally worth it. When you’re running longer distances, you’re going to want to carry some stuff with you. I got a SpiBelt for my keys and phone. I also carried along some mace for safety which attached directly to my belt. For the longer runs, I carried a 10-oz water bottle. Other runners prefer full hydration packs or vests. Several of my training runs were indoors on a treadmill. Make sure your machine has proper cushioning to protect your joints. There are some fantastic motivational features on treadmills these days that will make you feel like you’re running outdoors. Check out programs like iFit Live and Try putting your treadmill on a 1% incline to mimic outdoor running and take advantage of programs that help you train for hills. Buy a foam-roller and use it often. Here’s a great article from Runner’s World that shows you how to use it. I also used ellipticals and stationary bikes for cross training. They were life-savers especially on those cold winter days when I couldn’t run outside. Nutrition can be a bit tricky for runners. Experiment and find what combination of foods pre-run, during run, and post run work for you. Personally, I like to eat breakfast and then a light (100 calorie) mid-day snack before going for my run over my lunch break. Then I come back and eat a protein-rich lunch. Plenty of water is vitally important. I take a small 10 oz water pack along during long runs. Keep in mind that I’m training during the winter/early spring. When the temperature increases this summer, I’m planning to buy a hydration vest. Find the right tempo music playlist to amp up your running performance. I have a very specific playlist that I love to listen to while I run. Music that matches your step cadence is scientifically shown to increase performance. Dress in layers when it’s cool. I wear several thin layers when I run that can be unzipped when I start to heat up. I also highly recommend a pair of vented running gloves in the colder months. They are one of my favorite purchases! Use positive mental training techniques like positive affirmation statements and mediation to get yourself in the right mindset. Have fun! Congratulations for taking on this endeavor. Remember that the whole point is to challenge yourself and enjoy the experience.